TASHKENT -- Uzbekistani President Shavkat Mirziyoyev's reform of the nation's once-dreaded intelligence agency has observers agreeing that change has come to Uzbekistan. Changes in recent months to the National Security Service (SNB) included dropping that name -- it is now called the State Security Service (SGB) -- and firing its chairman who had led the agency for 23 years. Throughout the years, the former SNB drew criticism for obsolete methods of intelligence gathering inherited from the KGB and for routinely overstepping its powers. 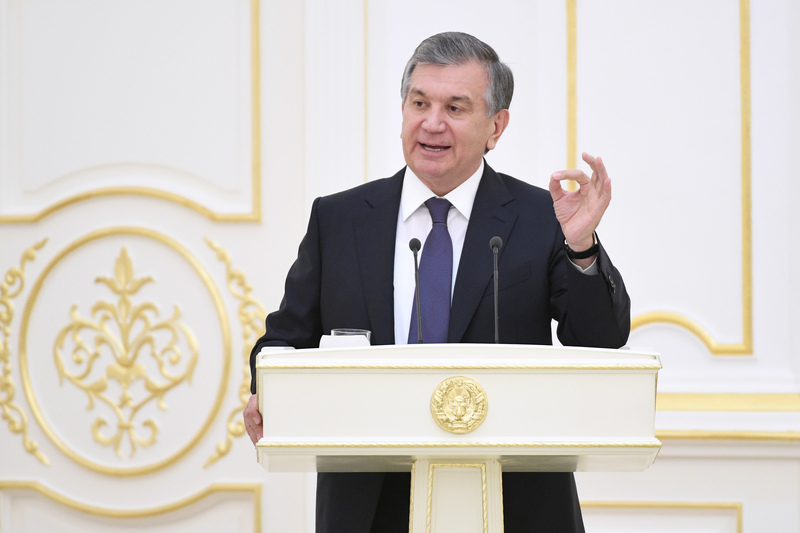 Reforming the SNB is essential to confronting changing security threats that the old SNB was not capable of combating, Mirziyoyev said in a December 22 speech to parliament, adding that the agency had benefitted from an unjustified growth of powers. "We need to reform this structure. The [National Security Service] should be on guard for our external and internal security," he said, according to AFP. "The unstable situation in some regions of the world will lead to an increase in migration ... and that in turn will allow a spread of terrorism and extremism," he said. The removal of 18,000 names from extremist blacklists, one of Mirziyoyev's signature reforms of 2017, bears witness to just how much overreach the SNB wrought in the name of security. "The SNB successfully fought off infiltration by extremists and terrorists, but with very harsh measures," Tashkent-based political scientist Valerii Khan told Caravanserai. "Residents of Uzbekistan saw the SNB as a repressive agency." Mirziyoyev's dismissal of Rustam Inoyatov, who had led the agency since 1995, on January 31 telegraphed the government's intentions for reforming the SNB. Mirziyoyev replaced Inoyatov with a former general prosecutor Ikhtiyor Abdullayev. Following that, in accordance with a March 14 presidential decree, the SNB became the SGB, dropping an acronym that instilled terror in many citizens. The March 14 decree justified the renaming by arguing that the term "national security" was too broad and enabled abuse of powers, while the term "state security" focused attention on true threats to the state. The decree tasked the SGB to fight terrorism, extremism, organised crime, and trafficking in weapons and drugs. Abdullayev on March 30 agreed with those priorities in remarks to journalists in Tashkent, Gazeta.uz reported. The SGB will need to confront the "activation of the 'Islamic State' [IS] terrorist group, the Taliban, the Islamic Movement of Turkestan and other militant groups in northern [Afghanistan], and the return of Central Asian [former militants coming back from the Middle East] ... to our country", he said. Other efforts will be directed against attempts to spread extremist literature, smuggle drugs and weapons, enforcing anti-radicalism legislation, and the recruitment of disgruntled migrant workers by extremist movements, he said. "For the entire 26 years of Uzbekistan's existence, the SNB worked not on the basis of laws but on that of a short cabinet resolution from 1991," Tashkent-based lawyer Muslima Khakimova told Caravanserai. "No other documents governed its activity." On March 29, the senate passed a law that "prescribes oversight of the SGB", Javokhir Mavlonov, a senate source familiar with the still unpublished text of the law, told Caravanserai. "The SGB is subordinate to the president, but it regularly informs the senate about its activities, and the general prosecutor's office oversees the legality of its work," he said. Soon after the passage of the law, other high-ranking officials from the time of the SNB were put on the chopping block, possibly for allegations of abusing their powers. Radio Free Europe/Radio Liberty on April 2 reported the arrest of Mansur Mirzayev, the former chief of the SNB's Tashkent Province office for fighting terrorism. A day later, it reported the arrest of the head of SNB's internal security, Gen. Khayet Sharifkhojayev. "This news inspires optimism," said Khan, the political scientist. "There's hope that after cleaning out its ranks, the SGB will begin to work much more efficiently and will turn all its attention to truly important threats."